b. the upward force exerted by the gas in a balloon, airship, etc. For a body moving in a liquid or gaseous medium, the lift acting on the body is the component of the medium’s total pressure force on the body in the direction perpendicular to the velocity of the body—or the velocity of the body’s center of gravity if the body is moving nontranslationally. The lift results from the unsymmetrical flow of the medium around the body. For example, in the case of flow around an airplane wing (Figure 1), the particles of the medium that flow past the lower surface traverse in the same period of time a shorter path than do the particles flowing past the upper, more convex surface. The velocity along the lower surface is consequently less than the velocity along the upper surface. According to Bernoulli’s equation, however, the pressure of the medium is greater where the velocity of the particles is smaller. The pressure of the medium is thus greater on the lower surface of the wing than on the upper surface, and lift results. The unsymmetrical flow around the wing can be viewed as the result of superimposing on a symmetrical stream a circulatory flow around the wing contour. Along the more convex surface the flow moves in the direction of the mainstream, and an increased velocity results. Along the less convex surface the circulatory flow is directed against the mainstream, with a resulting decreased velocity. The lift Y will then depend on the value of the velocity circulation Γ. 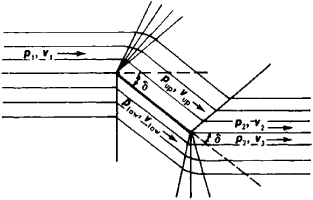 According to Zhukovskii’s theorem, when an ideal incompressible fluid moves in a two-dimensional parallel flow around the portion of a wing of length L, Y = ρvΓ L, where ρ is the density of the medium and v is the velocity of the oncoming flow. Since Γ has the dimension of [vl], the lift can be expressed by the equation Y= cy ρSv2/2, which is commonly used in aerodynamics. Here S is a representative area of the body—for example, the plan area of the wing; cy is the nondimensional lift coefficient, which depends on the shape of the body, the body’s orientation in the medium, the Reynolds number Re, and the Mach number M. The value of cy can be determined by theoretical calculation or experimental means. Thus, according to Zhukovskii’s theory, for a wing in a two-dimensional parallel flow cy = 2m(α — α0), where α is the angle of attack (the angle between the direction of the velocity of the oncoming flow and the wing chord), α0 is the zero-lift angle, and m is a factor dependent only on the shape of the wing profile—for example, for a thin cambered plate, m = π. In the case of a wing of finite span l, m = π/(1 — 2/λ), where λ = l2/S is the wing’s aspect ratio. Owing to viscosity, in a real fluid the value of m is smaller than the theoretical value, and the difference increases as the thickness ratio is increased. The value of α0 is also less than the theoretical value. Moreover, as α increases, the dependence of cy on α (Figure 2) ceases to be linear, and the quantity dcy/dα decreases monotonically, becoming zero at the angle of attack αcr corresponding to the maximum value cymax of the lift coefficient. A further increase in α causes a decrease in cy owing to separation of the boundary layer from the upper surface of the wing. The quantity cymax is of great importance, since the larger it is, the lower the plane’s takeoff and landing speeds. M < Mcr where Mcr is the value of the Mach number of the oncoming flow at which the local values of the Mach number near the surface of the profile are equal to unity—the compressibility of the gas becomes significant. In the case of slightly cambered and thin profiles, the compressibility for small angles of attack may be taken into account by assuming, as an approximation, that and . At supersonic speeds the nature of the flow around a body is considerably different. Thus, in the case of flow around a flat plate, rarefaction waves form at the leading edge on the upper surface, and a shock wave forms on the lower surface (Figure 3). The pressure plow on the lower surface of the plate consequently becomes greater than the pressure pup on the upper surface. There results a composite force normal to the plate’s surface. The lift is the component of this force perpendicular to the velocity of the oncoming flow. For small M > 1 and small α, the lift on the plate can be calculated by the formula cy = . This formula is also valid for thin profiles of arbitrary shape with a sharp leading edge. Zhukovskii, N. E. “O prisoedinennykh vikhriakh.” Izbr. soch., vol. 2. Moscow-Leningrad, 1948. Loitsianskii, L. G. Mekhanika zhidkosti i gaza, 2nd ed. Moscow, 1957. Golubev, V. V. Lektsii po teorii kryla. Moscow-Leningrad, 1949. Abramovich, G. N. Prikladnaia gazovaia dinamika, 2nd ed. Moscow, 1953. What does it mean when you dream about being lifted? Being lifted in a dream may indicate that the dreamer is rising above unpleasant conditions or issues. Being lifted can also have the same connotations as ascension and height. The vertical height traveled by a cage in a shaft. The distance between the first level and the surface or between any two levels. Any of the various gangways from which coal is raised at a slope colliery. 1. An elevator used on the stage of a theater, in the orchestra pit, or on the apron. 2. British term for elevator. 3. A handle or projection from the lower sash in a hung window, used as a grip in raising the sash; also called a sash lift. 4. One of a number of frames of scaffolding erected one above another in a vertical direction. 5. The concrete placed between two consecutive horizontal construction joints; usually consists of several layers or courses. 6. In reinforced concrete construction, that portion of a wall, pier, abutment, etc., placed in a single pour. 7. The amount of grouting or mortar placed at a single time in a building structure. 8. In a multi-level excavation, a bench or step. i. That component of the aerodynamic forces acting on the wing or airfoil section that opposes gravity. It is perpendicular to the flight path or free-stream flow. Simply put, it is the difference between the static pressure on the airfoil lower surface and that on the airfoil top surface. 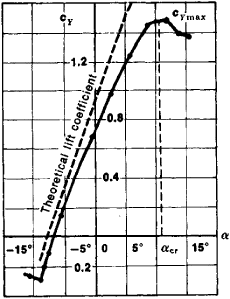 Lift (L) = coefficient of lift (CL) ½ × density (ρ) × velocity square (V2) × surface area of airfoil (S), or L = CL ½ρV2S. ii. The whole or part of an airborne operation, as in the Berlin Airlift. The terms first lift and second lift also are used in the same sense. Keep your chin lifted toward the ceiling and your elbows pointed out. Participants grasped the handles of the weight carriage from a starting position of 40 cm and lifted to a handle height of 152 cm. To analyze proper ways to prevent lifting and handling damage, it is important to consider the lifting base, the arms, the required movement and the characteristics of the lifted object. Applying this operation successively to all the rod ends elevates the load by the same distance that one rod is lifted -- a divide-and-conquer strategy for coping with a massive weight. By early evening, the last container was lifted into place and all documentation completed. Biodex's integral lift mechanism allows patients to be lifted directly from a seated position. Hold lifted pose thirty seconds, then lower entire body to surface. It didn't help, Erin recalls, that when the plane lifted into the air, her stomach started "going weird. Studies estimate that if the ban on travel to Cuba were lifted, as many as 2. It comes equipped with a simple sling that fits under the arms and around the back of the resident, Handlebars allow residents to grasp for stability as they are lifted up into a standing position. Bob Christina, renowned Motor Learning expert, states, "It is the neurological intent to raise a weight fast that is the key to developing explosiveness, not that the implement itself is lifted fast. Always assess the resident or object being lifted and get help if the resident is too heavy or the object too awkward to handle alone.